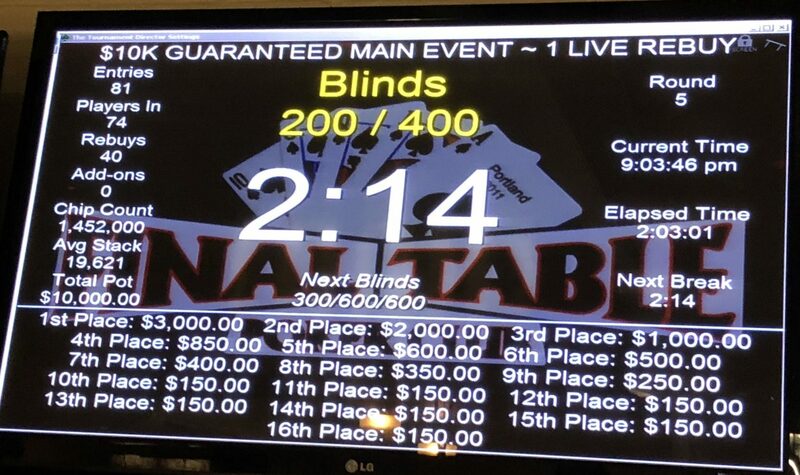 Just a month to go and it was the last live game of November, the $10K GTD NLHE at Final Table. It didn’t go well, which is why I’m writing this instead of still at the club. In the first level, I raised AxJx, got a call, and was re-raised by the button. I played it conservatively when there were a couple calls of the re-raise, then the hand played out and I was a little irked with myself when the button won the hand with Ax[qx[after][the][board][paired][my][jack. ][Which][played][into][my][decision][to][go][all][in][on][over][a][turn][raise][from][the][same][player][on][a][hand][with][AxQx and a flop of AxTxTx, only to get myself stacked by KxTx. Managed to lose half of my rebuy stack before the start of the final level before the add-on break, then got it all in with A♥5♥ over two limps, Another player raised all in for a lot more with TxTx and the short stack on my right got in with KxQx and just 75 more chips than me. The flop came down AxKxQx and the guy on my left was elated until a jack on the river made Broadway for the tens.